A lifting range containing injectable active ingredients for a 7-day lift effect! Dubai, UAE, March 14, 2018: From the age of 40, the collagen and hyaluronic acid synthesis processes slow down, and this has multiple consequences that can be seen when you look in the mirror: the cheeks become hollow, the cheekbones are less prominent, the features collapse and become lined, the face shape appears less defined, and the skin begins to droop. The result? Your face seems less dynamic and your expressions appear sad or stern. 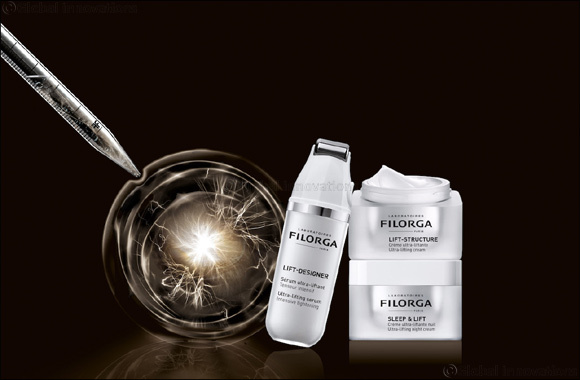 Thanks to Filorga’s new Lift Range, sagging skin is a problem of the past! After three years of formulation, the core formula in the range is unprecedented in cosmetics: Plasmatic Lifting Factors (Cellular Factors + Collagen + Hyaluronic Acid) What’s special about it? The range combines all the injectable facelift techniques to revive the entire skin’s firmness processes simultaneously. This breakthrough formulation combines the best injectable ingredients from the latest anti-sagging techniques and includes them for the first time in a core cosmetic formula, to reshape the features, plump the skin and sculpt the volumes in record time. The Lift Range is more than just a skincare range; it is a real ultra-lifiting programme featuring three products that act on all aspects of skin sagging throughout the day. Each of the three products in the range contains specific active ingredients form the latest scientific research for a targeted anti-sagging action. Enriched with Plasmatic Lifting Factors, naturally, this serum has a surprising stretch texture which creates a reinforced tightening effect through the addition of lifting botanical active ingredients and its ice-cool roll-on applicator. This smart and practical product for instant tightening boasts an ultra-sensory fluid that penetrates quickly and leaves the skin feeling fresh for a double tightening effect and a boost of radiance, with no stiffness. To apply, hold the product vertically and press the button to bring the product up to the applicator. Then apply the product using the roll-on by pressing down gently on the skin. Start with the neck, move onto the cheeks and finally to the forehead, going up from the centre of the face towards the contours. Finish by massaging the product in with your fingertips. Here, Plasmatic Lifting Factors are enhanced with stimulating botanical active ingredients that can boost the production of collagen and elastin. All these benefits are contained within a luscious texture that leaves the skin surprisingly beautiful and completely comfortable. This high-tech texture cream with a “beautiful skin finish” is rich enough to nourish the skin and provide it with comfort during any challenge, but also fine enough to glide onto the skin and bring instant radiance. It’s the skin’s daily anti-gravity workout! In addition to the Plasmatic Lifting Factors, this product contains a regenerating amino acid duo to redensify the skin and shape the features during the night. This ultra-lifting night balm benefits from the cell’s nocturnal activity to plump up the face. It has a pampering and enveloping texture for ultra-sensorial application that brings nutrition and comfort. Filorga Lift Range is available from March 2018 in leading pharmacies including Bin Sina Pharmacies, Boots Pharmacies, Supercare Pharmacies, Planet Pharmacies, Health First Pharmacies and Community Pharmacies.